India's Polar Satellite Launch Vehicle, in its thirty-second flight (PSLV-C29), launched six satellites of Singapore into a 550 km circular orbit inclined at 15 degrees to the equator. Of these six satellites, TeLEOS-1 is the primary satellite weighing 400 kg whereas the other five are co-passenger satellites which include two micro-satellites and three nano-satellites. 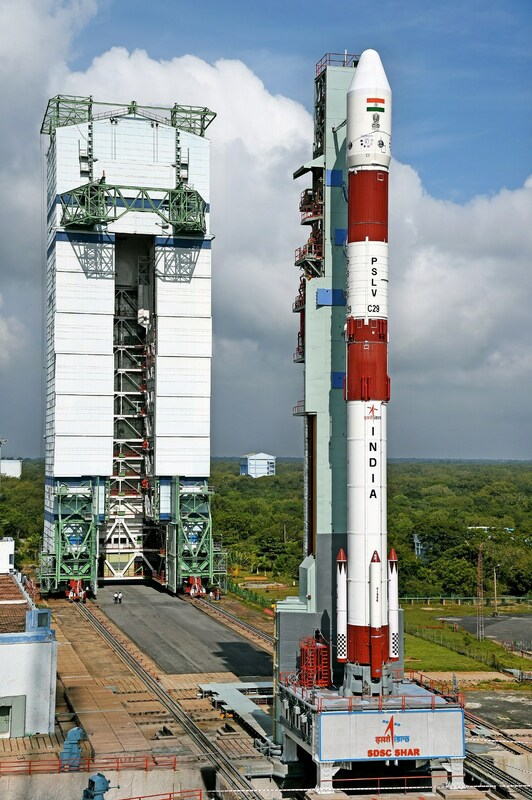 PSLV-C29 was launched from the First Launch Pad at Satish Dhawan Space Centre (SDSC) SHAR, Sriharikota. This is the eleventh flight of PSLV in 'core-alone' configuration (without the use of solid strap-on motors). Along with TeLEOS-1, the five co-passenger satellites launched are VELOX-CI (123 kg) micro-satellite; VELOX-II (13 kg) 6U-Cubesat technology demonstrator; Athenoxat-1, a technology demonstrator nano-satellite; Kent Ridge-1 (78 kg), a micro-satellite; and Galassia (3.4 kg ) 2U-Cubesat. "PSLV-C29 Successfully Launches all the Six Satellites from Singapore from Satish Dhawan Space Centre (SDSC), SHAR, Sriharikota on December 16, 2015"
Antrix Corporation Limited (ACL) has entered into the Launch Services Agreement with ST Electronics (Satcom & Sensor Systems), Singapore during February 2014, for launch of TeLEOS-1, an earth observation satellite of ST Electronics along with five co-passenger satellites from Singapore Universities.